Since the early 1800s chemists have been fascinated by the concept of catalysis, a phenomenon in which at least one component of a chemical reaction enhances the rate of the reaction but is not consumed. Biological systems, using enzymes, mastered the art of catalysis long before chemists coined the term. While we still have much to learn about the relationship between an enzyme’s sequence and its catalytic function, we are beginning to make strides in engineering proteins to adopt our desired transformations, even those which are not known in biology. One transformation which captured our interest was the transformation of a sp3-hybridized carbon–hydrogen (C–H) bond to a carbon–carbon (C–C) bond. Since C–H bonds are ubiquitous in organic molecules, methods which selectively alkylate a C–H bond provide an elegant strategy for chemical synthesis. While a few natural enzymes have evolved to perform this transformation on certain metabolites (e.g. some radical SAM enzymes), we were impressed with a strategy developed by organic chemists, carbene C–H insertion, due to its demonstrated versatility. Carbene C–H insertion is not a known mechanism of any natural enzyme and we were curious as to whether a natural enzyme could be altered to adopt this function. We chose to investigate proteins which have a heme cofactor, such cytochromes P450, cytochromes c, and various globins for this chemistry, since it had been previously demonstrated that heme proteins are able to access an iron carbene intermediate. However, it was not known whether the protein-enclosed iron carbene could insert into a C–H bond. Examples of iron carbene C–H insertion are rare in the literature, leading some people to hypothesize that iron carbene is less competent than other metal carbenes for insertion into a C–H bond. Indeed, those working with artificial metalloenzymes have pointed to the relative scarcity of this transformation (amongst others) with iron as one reason the introduction of noble metals, such as rhodium and iridium, to proteins could be desirable. In contrast, and perhaps naively, we felt that the correct protein scaffold could enable this transformation using an iron cofactor. After searching through many natural and previously engineered heme proteins, we finally identified one derived from cytochrome P450BM3 from Bacillus megaterium which catalyzed an intermolecular carbene C– H insertion reaction with low activity (Fig. 1a). Using directed evolution, we created enzymes which are highly efficient for this transformation and could functionalize benzylic, allylic, and α-amino C–H bonds with good enantioselectivity (Fig. 1b). 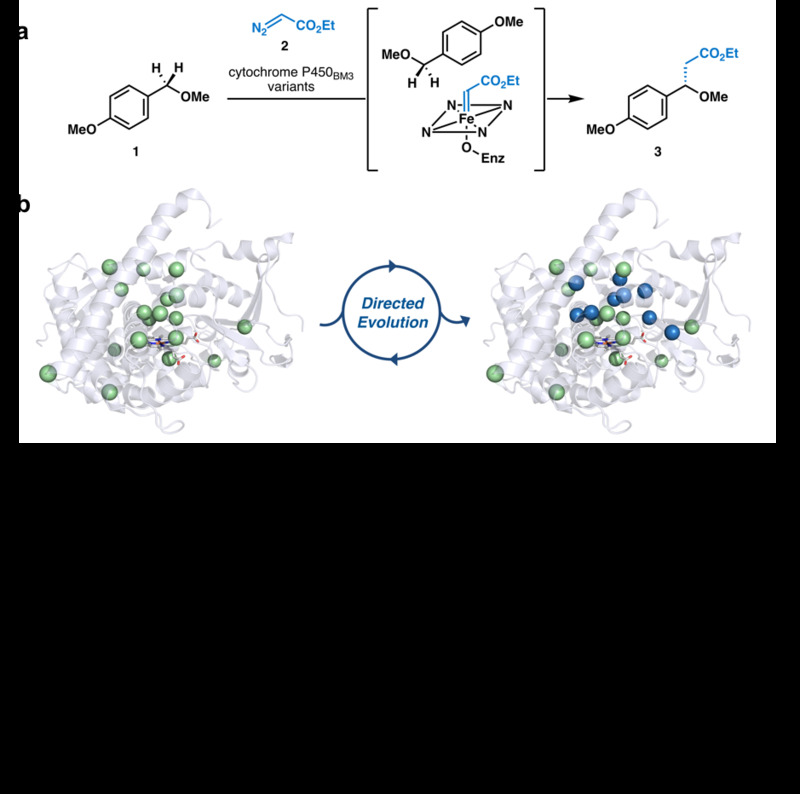 While we have successfully demonstrated that iron-containing enzymes can perform carbene C–H insertion, bringing a new C–H functionalization strategy to biology, this is only the beginning. C–H functionalization is challenging because C–H bonds are ubiquitous in molecules and typically inert compared to functional groups. Our evolved enzymes demonstrate chemoselectivity and regioselectivity on certain substrates with functional groups or several similarly reactive C–H bonds, but more work is needed to develop a suite of selective enzymes and to understand the physical basis for these selectivities. To push the frontiers of iron catalysis, we are curious to discover if a broad range of C–H bonds, including those with high bond dissociation energies, can be selectively transformed with this chemistry. The partnership between proteins, directed evolution, and organic chemistry will result in the invention of new chemical transformations—we’re excited to see what comes next.